The physical manifestation of agile stories are a description of the requirement (in the form “as a [user], I want to [goal], so that [reason]”) written on an index cards with the acceptance critiera written on the reverse. The developer can pick up the card and work with it. Once the acceptance critiera are met it can be put in the pile of completed cards. If at any stage of the process we are not happy with the card, given that it is only a “promise for a conversation,” it can easily be torn up and rewritten. Tearing up cards is a powerful statement. We don’t like what we’ve written? That doesn’t matter, rip it up and start again. That works well in the opening stages of a project, but sooner or later the cards will be copied into a spreadsheet and this is where the problems start. We become attached to the story; good project management discipline demands we keep an audit trail of what we do. Suddenly it is not so easy to rip up the card. Maybe the initial story did not truly represent the requirement. More often than not the story title, and detail will remain the same, but a notes column will be spawned in the spreadsheet and the change to the story will be entered as narative in this column. Clearly this is not a satisfactory way of doing things. Part of the agile coaching process has to be around the flexibility of requirements, and this includes refining, rewriting and splitting stories as the project progresses. The underlying scope of the project will remain the same, however inevitably the estimates will change. This is often difficult to accept if you are versed in traditional project methodology. At the beginning of waterfall projects you have certainty, clearly defined requirements and a plan to guide you by. It is towards the end of the project where deadlines slip, scope is managed by change requests and IT is cursed as being unreliable, untrustworthy and the breaker of promises. The reverse is true with agile. There can be a whif of unreliablity in the early stages of the project, particulalry if there is no clear plan. This is excerated with an excel storylist that changes by the day. The difference is that you are more likely to succeed in delivery when going with the agile approach. The bottom line has to be an acknowledgement that there will be pain during the opening weeks of a project. Stories will be ripped up – delete them from the spreadsheet and don’t bother to keep an audit trail. Agree that the story list will be in a state of flux for the first few weeks. And once the project is settling down, once we have a better understanding of the project and are happy with stories, only then should we use formal PM tools with confidence. Hello. I’m a developer. I’m going to build your product. I do what the BA tells me. Hello. I’m a business analyst. I’m going to articulate requirements for the developer. I listen to the product owner. Hello. I’m the product owner. I’m responsible for what goes in it. I’m going to tell the BA what it should do. I listen to the sales Manager to find out what features the product needs. Hello. I’m the Sales Manager. I know what features my customer wants, I listen to them. Hello. I’m Head of Procurement. I’m responsible for selecting the product. I tell the Sales Manager in the product company what we want. I know what we want because I listen to the Division Managers. Hello. I’m the Division Manager. I want a product that does %%&***£$%£ to drive my sales. Give me a product that does that. Hello. My name is Sally. I use the product. You know, the thing I really like about it is $%$£$$£^. And here’s a list of what I really hate. Give me a bit of $££%£$”£ and I’d be so much more productive. But noone listens to me. Hello, I write this blog. I’m an interaction designer. I’ve just sat with Sally for the morning and seen what she’s done. And you know what – we’re getting this wrong. What she really needs is ########. That would really add value. And it’s is far simpler, quicker and cheaper to deliver than what your guys were proposing. I recently found myself in the role of “BA” on a project. I’m usually involved in “quick starting” projects; driving out high level requirements, developing project / programme roadmaps and helping clients produce tangible visions of where they want to get to. For me, the story lifecycle ceases at the “as a… / I want to… so that…” It is still a placeholder for a conversation – we’ve not yet started to look at the detail. So It’s been good to drill deeper into the anatomy of a story. and so I found myself with the daunting task of writing “acceptance criteria”. Inspired. Suddenly the acceptance criteria are in language that I can understand. It becomes a joy to tease out criteria. And it is easier to say when enough is enough – it is after all about diminishing returns (hey Dan?) The value really shone out when a client was explaining complex rules around how some equity trading functionality would work. It was hard to understand what the requirement was. So I asked him to put himself in the shoes of the developers who will build the functionality. How will they know when they are finished? I scribbled out three columns – given / when / then. He then succinctly articulated the scenarios within this framework. What had been hard for him to explain, and even harder for me to comprehend suddenly became clear. Within a couple of minutes we had the story wrapped up were able to move on to the next story on our pile. This agile lark. It’s like build a car right? It’s great when your client gets it. He gives us the analogy. It’s like a car. Release planning is all about getting the car out on to the test track. It’s gotta have a chasis, four wheels, an engine and a steering wheel. Iteration planning? What order should we build stuff in. Well we don;t need the wheels until we’ve got the chasis. The engine is a high priority and there are a lot of dependencies associated with it. And we don’t really need the sterring wheel if we are happy to test on the straight strip… But remember, just because the wheels come lower down the plan, the release isn’t complete until they are all on… And also remember that this is just the “bare bones” of the car. It drives. We can’t acutally take it to the motor show until it looks good. And we can’t take it to the market until it is comfortable. In financial markets, the traders love spreadsheets. It’s easy to wonder why and fight the trend. This cartoon, Captain Agile and Fubar – Listening ain’t easy made me smile. What do you mean by “the customer”? As agile practitioners we wax lyrical about “the customer”. But who do we actually mean? More often than not it is the “business”. A vendor relationship is implied, with IT supplying goods and services to the customer, who is the business. But the business is not really the customer. They are more an intermediary. An intermediary who in turn provides the product or service to the people who will consume them; the real customers. Yet if these real customers or consumers are considered at all, they are relegated to the title of “users”. Calling the business “the customer” is an artificial construct based upon an arms length relationship between business and IT. Once this boundary is removed the real customer emerges. 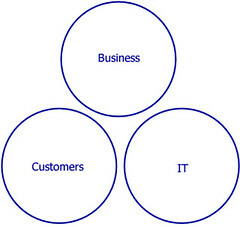 Moving beyond the vendor relationship between IT and business towards a partnership ensures a common customer. And ultimately it is this customer that fuels an organisation. (In the CIM marketing glossary, there is no entry for “user”. There are two for “consumer” and six for “customer”. Not all projects will involve retail customers – think of call centre dudes. But I think the point is consistent…).